The more accurate way of saying that was I passed my Kindle -- what was a good little e-reader -- along to someone else and bought a Kindle Fire HD to use. Why did I spend the money? I mean, the little Kindle device worked just fine. Well, if I hadn't had some Amazon gift card credits that offset a good portion of the cost, I may not have made the purchase. At least, not just yet. And, without the credits, I may have purchased the standard Kindle Fire, rather than spending the extra money for the HD version. But, I did so I did. And I'm glad I did. Again, nothing wrong with the standard Kindle, not even the low-end cheap one I had. But, the Kindle Fire is a great little e-reader, plus it's a very good little tablet. The one I got is the smaller, 7-inch version. It's just a little bigger than the standard Kindle devices. It connects via wifi only. The larger 8.9" Fire HD has AT&T 4G LTE capability starting at an additional $50/year. The Kindle Keyboard and a version of the Kindle Paperwhite have free 3G connectivity included. It's kinda hard for me to compare the Kindle Fire to a standard Kindle e-reader without breaking the functionality into two categories: e-reader and tablet. I'll cover the e-reader part first. The standard Kindle e-readers currently come in four varieties: Kindle, Kindle Keyboard 3G, Kindle Paperwhite, and Kindle Paperwhite 3G. The Paperwhite versions, which I haven't used, come with a built-in light. I hear it's nice. The Kindle and Kindle Keyboard models don't have a light. If you need a light, they sell covers with extendable light sources. Or, you can turn on a lamp. The Kindle e-readers (the non-Fire Kindles) can be easily used in direct sunlight, just like a book. As e-readers, they're great. I love the convenience of having a lot of books available in one little device. The Kindle Fire doesn't need a light source. Just like you don't need a light to see the content on your computer screen, you don't need a light to see the content on your Kindle Fire screen. The drawback is in direct sunlight. While the Kindle Fire does appear to do a better job at handling glare than my older iPad (1st generation), the standard Kindle has no glare, and therefore, problem at all in direct sunlight. The Kindle Fire is a color screen, and allows to set the r-reader display to black text on white background (default), white text on black background, or black text on sepia (my preference). With the standard Kindles, you press the buttons on either side to turn the pages. On the Fire, a touch on the edge of the screen or a swipe will change the pages. The most obvious difference is the e-reader displays are black-and-white (just like a book) while the Fire displays are in color. When browsing the store for more content, the color is nice. Strictly as an e-reader, the Kindle e-readers are slightly better -- but only ever so slightly -- than the Kindle Fire, in my mind. That brings us to the tablet portion of the comparison. And, there's no comparison. The Kindle e-readers are strictly e-readers. So, it may be better to compare the Kindle Fire to the iPad. And I will. As a tablet, the iPad is a better tablet than the Kindle Fire. But not a lot better. While the iPad is an excellent tablet, the Kindle Fire is a very good tablet. Make that a very, very good tablet. Almost excellent. The advantage the iPad has is in the apps. The Apple App Store has a really huge selection of apps. The Kindle Fire, although an Android table, doesn't access the Google Play store. Amazon opted to go the Apple route. You get your apps from Amazon. That does help weed out a lot of really useless apps, like is common in the Google Play store. But, it also keeps out some good apps. 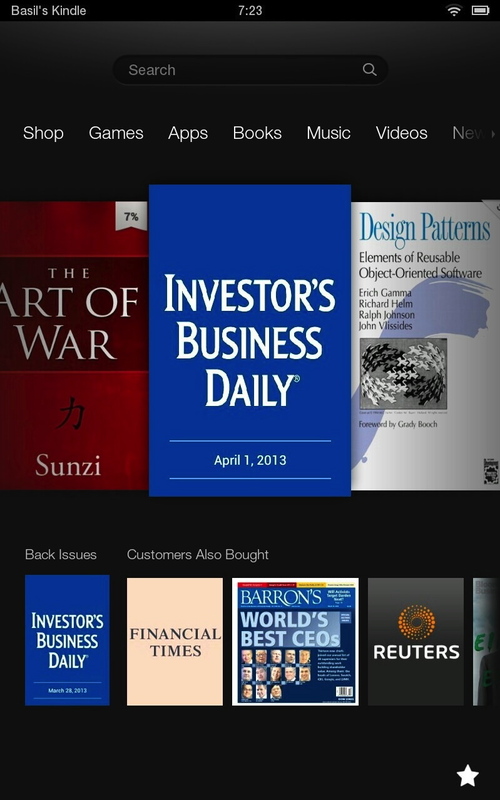 When I started adding apps to the Kindle Fire, it had the apps I wanted to add first. Of the apps on my iPad that I use regularly, it's primarily local news apps and games that are lacking. For the news apps, the Web browser covers adequately for my purposes. Where the Kindle Fire shines is music and videos. The integration of those categories into the interface is seamless. The Kindle Fire integration with Amazon Instant Video is better than the iPad integration with iTunes. Switching between your local library and the online store simple refreshes the content on the page with the Fire. On the iPad, switching from local library to the online store obviously switches apps. While it's not a problem with the iPad, the Kindle Fire does it better. Overall, though, I like the iPad as a tablet a little better. I don't like the iPad as an e-reader, though. While iBooks works well, and while there is a Kindle app for the iPad, the Kindle Fire does a superior job of integrating e-reader functionality into the tablet experience. So, as an e-reader, the Kindle standard e-readers are better than a Kindle Fire, but not by much. As a table, the iPad is a better tablet, but not by much. I suppose the best way to boil it down would be for me to assume I have none of the devices, but had experience with all the devices. That is, if suddenly, if I had to replace them, what would I do? I'd buy a Kindle Fire. And that's someone who really loves his iPad talking. I own two kindle e readers The paper white , and the entry level one. I only read books on these. I also own a 7" kindle fire HD and a Ipad. I agree with you on your points. For reading the two e-ink readers are better for that. Between the two Tablets the I pad is better, but I find myself grabbing the Kindle Fire when walking out the door because of portability. You can find some of the apps not in the Amazon app store on sites like Get Jar and 1 Mobile market. Just before the Kindle Fire launched, I was traveling a lot. The new Kindles had already hit the shelves, and I got one. It was a very nice travel companion. I downloaded some books and magazines, uploaded my work documents, travel information, and restaurant reviews, and subscribed to a few online publications. For the first time ever, I thoroughly enjoyed traveling. A few weeks later, the Fire launched. I got one. I loved it. Add games and apps to the list of things my travel companion could do. It read to me, played me movies and audio books, and was a better e-reader in dim light. That Christmas, I got everyone a Fire. I just bought a FireHD. It's amazing. The screen, the speakers, and performance are all improved. I coupled it with a Bear Motion case with bluetooth keyboard. All of a sudden my 'go to' computer is a Kindle.